I decided to allow my inner geek have a trip out, and so we went to the talk at Magdalen College Library ‘Classifying the world: John Wilkins and the invention of a universal language’, by Tabitha Tuckett, who is one of the librarians there. 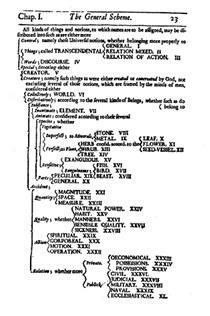 John Wilkins was a clergyman and scientist from the seventeenth century who decided to try and make up his own language, to be understood by all, and his method of doing so was essentially to classify the world. As Wikipedia says, it was “brilliant but hopeless”. I wasn’t sure what to expect. I mostly associate language invention with Tolkien, and my immediate mental image of an invented universal language is something like Esperanto. Wilkins’s invention of a universal language was different to both.He did not base his language on other European languages, rather, he believed that the way to achieve a language to be characterised by ease and usefulness was to base it on a logical system of classification. He would use categories and subcategories to create building blocks for conveying meaning, and attach phonemes to each building block to create words. In the seventeenth century there was a movement to try and bring about a universal language, to create a language that could be understood by all. This movement was in part brought about by the decline in Latin as a lingua franca, and also by the increase in travel to parts of the world where the people spoke languages nothing like the European ones. Wilkins developed a system of hierarchical classification, which he intended to be both spoken and written. The gist I got was that Wilkins’s aim was to arrange all human knowledge into categories, like Linnaeus would later do (with more success) with plants. He tried to arrange all of human knowledge into categori es. Wilkins started with a broad concept, represented by one letter, and then added suffix after suffix to narrow it down. He had forty broad categories (genuses), ranging from God to disease to stones. Each genus could then be divided into sub categories, to aid the defining of them. Stones, for example, could then be divided into vulgar stones, middle prized, or precious; dissolvable and non-dissolvable. And vulgar stones could furthermore be sub categorised into greater or lesser magnitude, and so on. His work then becomes of interest to linguists. I found the relationship between Wilkins’s language to his script and pronunciation quite hard to grasp. He developed a script, all squiggles, represented meaning directly. This means that his words could be written without ever being spoken, and his language was more of a classification scheme than a language that Tolkien might have made up. I found it extremely interesting, especially how his language was limited by the inability to classify the extent of human knowledge. It was also limited by issues with tense and voice, and was a very brusque way of communicating. Nevertheless, it was fascinating to see how even attempting to add a classification system to the world could create a comprehendible language. Excellent post, Charlotte. It is always interesting to learn about other classification systems, and their underlying rationale. May I know the name of the author of this blog entry? I would like to cite it in an academic paper. The author is Rebecca Hunt.